iRealHousewives | The 411 On American + International Real Housewives: Phaedra Parks’ New Boyfriend Tone Kapone Reveals How They Met; Porsha Williams And NeNe Leakes React To Their Relationship! Phaedra Parks’ New Boyfriend Tone Kapone Reveals How They Met; Porsha Williams And NeNe Leakes React To Their Relationship! As previously reported, Phaedra Parks confirmed that she is in a new relationship and is dating Chicago radio host and television personality, Tone Kapone. Recently, Parks shared a video clip of an interview that her boyfriend did with The Jam on her Instagram. In the interview, Kapone revealed how the two met. He revealed that they were connected by mutual friends and then he "slid into her DMs." Phaedra noted on Instagram that she was glad that Tone decided to "take a chance." "I kind of knew she wanted me to say hi because the mutual friend said say hi," he shared during the interview. "We were just, 'Hey, how you doing?' Just normal people talk because you don't want to say anything crazy because you get screenshotted, like, 'Look [at] what this fool sent me.'" Tone said that he and Phaedra had instant chemistry with "great conversations that last for hours and hours." 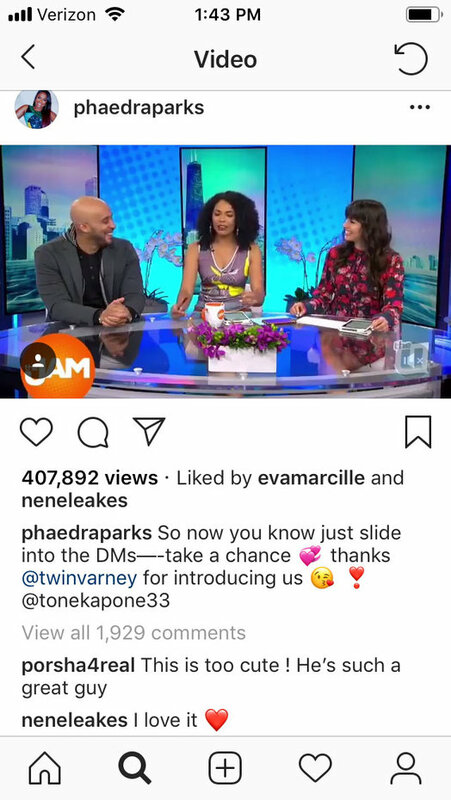 With Phaedra based in Atlanta and Tone based in Chicago, the two are currently dating long distance and have been flying back-and-forth to see each other, according to The Daily Dish. "She's funny as ever. Like, just one of the funniest women I've ever met," Tone gushed about Phaedra. "She's super cool." The couple got a lot of love from the RHOA ladies. Eva Marcille liked the post, as did Nene Leakes, who also wrote "I love it" in the comments. As for Porsha Williams, "This is too cute!" she commented on the post on Instagram. "He’s such a great guy."